It is hard to believe that a year has passed since my friend's baby was born. I'm not sure where the time goes but when it does go, it goes quickly! In honor of the little guy's big day, I made him a youth quilt, hopefully large enough to see him through the next few years. 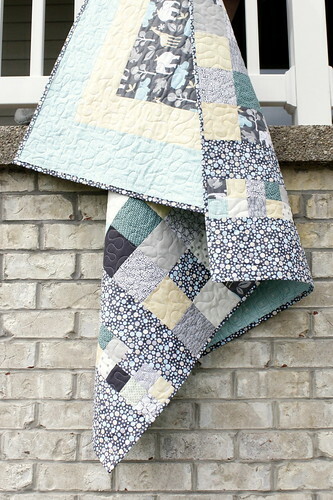 Much of this quilt was made using fat quarters from my never ending stash. I love fat quarters and gobble up as many as I can whenever I encounter them. I find that when I buy what I like, despite having no particular project in mind, I'm always able to pull together a cohesive palette with what I have on hand. Machine quilted with my no fail, long arm meandering pattern, I have finally become comfortable with this technique and can finish a quilt in about an hour. This is quite an improvement from where I started a year and a half ago. Yet another sign that it is time for me to branch out and start exploring other patterns. 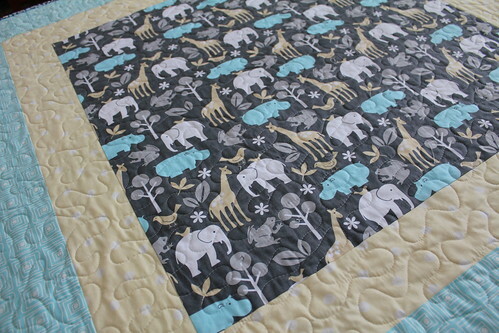 The back of the quilt features a framed panel of animals. I envision this keeping the kid entertained for a few minutes here and there. 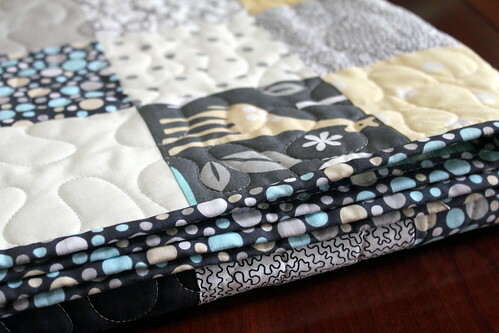 I continue to use my AccuQuilt Go Baby cutter to make binding strips. I have no regrets for this purchase at it has been a reliable machine with consistent results for quite some time now. It gets thumbs up from me. Such a lovely gift!! 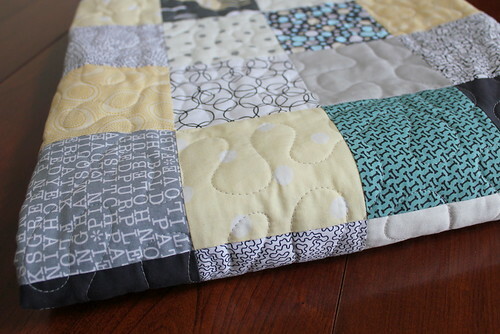 Your meandering pattern is perfect for this material. 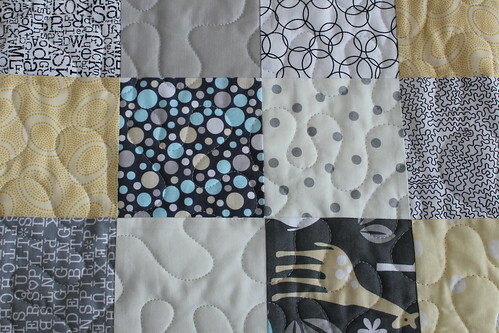 I am curious as to how the AccuQuilt Go Baby cuts the binding stips... across WOF at 2 1/2" ? Thank you ladies! 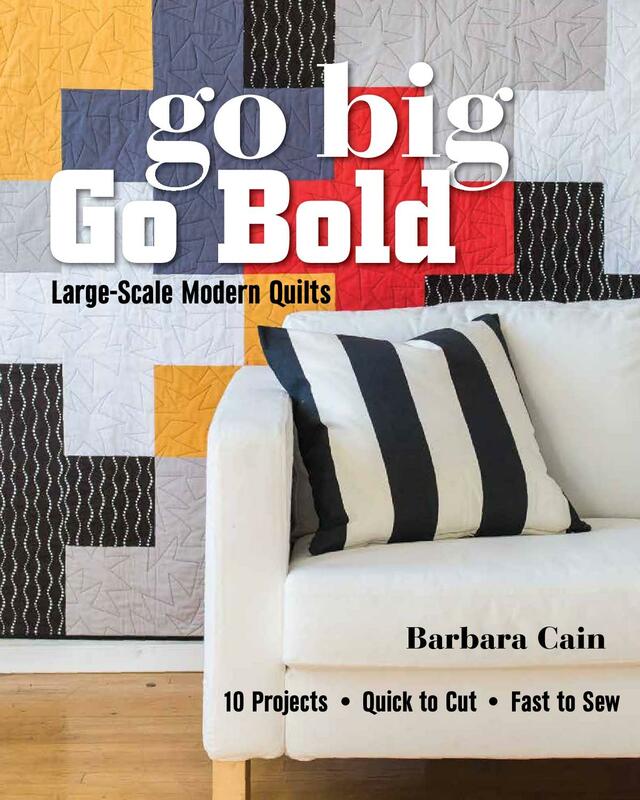 Yes Amy, I use the Accuquilt 2-1/2" strip cutter. 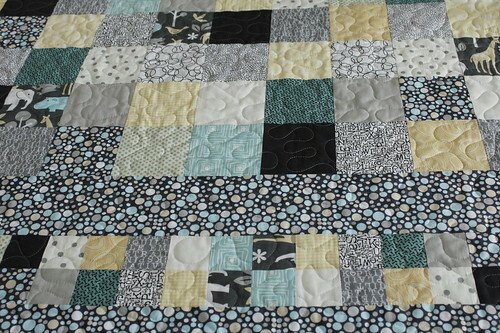 The die cuts two strips at a time and is 24" wide. I fold my fabric in half along the width and roughly cut off a 10+" slice. I fold this in half to form a folded 5+" x 22" unit. It takes about ten seconds to run this through the cutter and I end up with four, perfectly cut strips. It is a great machine. B.